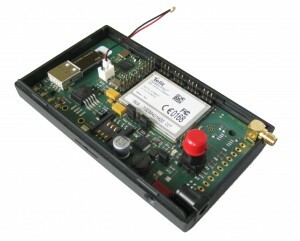 This M2M module is a perfect playground for any developer that would like to create a powerful M2M device cheap and quickly. If needed I can help with software source code, hardware development of customised M2M applications and with resources for software development as well. Just drop an email to harald.naumann (at) gsm-modem.de or use the form to get further details. Good afternoon, i have been reading on your website about your “M2M module with single PC on ARM9 that supports GPRS” product and would like to know how much these sell for before i start asking any technical questions. Dean, most products at the weblog are developed by business partners of mine. My part is often to make the hardware or software concepts. This starts with proposals for wireless modules and antennas followed by micro controllers and power supplies up to batteries and chargers. The M2M module you mentioned was developed by a 12 years old business friend of mine. I will help you with the contact and the price lists. I am a LAY PERSON in relation with M2M communication system. I only know what â€œI wish to doâ€ and I am looking to get the best equipment and the best provider for our communications. What we require is a SIMPLE transmission of up to 25 digits from our stores POINT of SALES to our office. 1. We have 1,000 stores that need to send to our office daily (depending on the store size) from 600 to 1,500 instances message of 20 to 25 numerical digits. 2. The numerical digits represent the telephone number of the participating clients and the total amount of purchasing at the store. 3. The 20 to 25 digits are INPUT at POS time by the storesâ€™ CASHIER. I suppose that we need a cellular communication system embedded in a Numerical Keypad with large keys (to make easy the inputting to the cashier) and STRONG TO TOLERATE the daily inputting of up to 25,000 hits. I hope that such cellular communication equipment embedded in a numerical Keypad existâ€¦ to send that 25 different digits manually input. If does not existâ€¦ I think will not be difficult to add a modem with a SIM card to a numerical keypad? After our company receives the informationâ€¦ we will send a SMS to the clientsâ€™ phone number with the balance they have in their account. If you cannot provide it, will you be so kind to direct us to the right company? Ricardo, why you do not use just a cheap Android tablet plus an app that will send the 25 digits by SMS, USSD, TCP/IP or UDP/IP. You also can use a private Twitter account with Twitter client to send the 25 digits to Twitter. Do you have Wifi at yoir point of sales? If not, then you have a cellular operator. Does it support , over the air application firmware update ? what is the mode of user app upate ? Narender, sorry do not understand your question? Most of my customers are able to change the firmware over the air. This is not a part of the operating system. This is their own know-how.